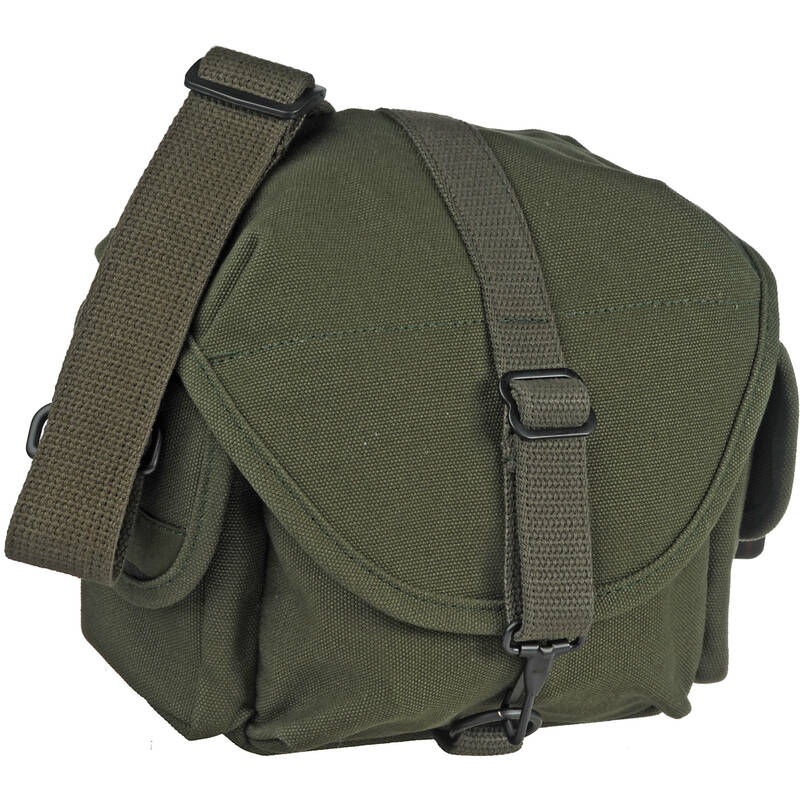 Box Dimensions (LxWxH) 9.3 x 7.5 x 5.0"
F-8 Small Canvas Shoulder Bag (Olive) is rated 4.5 out of 5 by 56. Rated 5 out of 5 by fotog61 from Just the right size Was planning a day trip to Gettysburg and needed a bag for my Canon G11 & Nikon P7000 plus books, memory cards, and extra batts and this was the perfect size everything fit. And I also put my GE video camera in a side pocket and charger in the other pocket AND I also fit my GPS unit across the top. I do own one other Domke bag which is in storage with other camera equipment in (bigger camera) and absolutely love the Domke brand it doesn't scream CAMERA GEAR HERE COME AND STEAL ME and I do believe it's water proof AND the big seller is that it's MADE IN THE USA!!!! Look for the flag before you buy. Rated 4 out of 5 by Docbaum from Domke F-8 Canvas Bag Holds my Nikon D40, 18-55 mm and 60 mm lenses comfortably. Camera access with either lens attached is excellent. Front pocket carries pen, pad, lens caps, SD cards, etc. Side pocket will hold cell phone or iPod or other small item. Bag was a bit tight until canvas softened with use. Velcro closures are secure. Water resistant as advertised. Made in U.S.A. Overall, an excellent bag with only one drawback. The metal snap hook tends to swing around and may smack your camera when you open/close the bag. Rated 5 out of 5 by Don from Domke shoulder bag. I have used an Original Domke bag for over 30 years....This one is just as good. It is made very well with the best of materials. The quality of construction is as good as the very original bag that I own. I use the bag to carry my D 7000 and some very basic items. I wanted a small lite bag to carry on a plane when traveling to various vacation or business destinations and this bag works very well for this purpose. The bag is quite small and only fits the D 7000 with the the 18-200 attached. If you want a bag that has room for a lot of your needed equipment and supplies, then this is not the bag fo you. You should purchase one of the larger Domke bags. Rated 5 out of 5 by Anonymous from great bag! I have a Panasonic G-1, and this bag is the perfect size for camera, plus extra lens(es) and a few miscellaneous items (phone, battery charger, extra memory). Easily accessible main compartment for quick access on the go. and, as usual, Domke provides bags with great construction. Rated 5 out of 5 by Anonymous from Great for day use This bag is great for casual day use if you plan on carrying your DSLR and not packing it in the bag. The bag will carry two lenses without body, wallet, cell phone, and other odds and ends such as spare batteries or flash in the end pockets. This is a great light use bag -not big enough to cause neck or shoulder strain after a day of walking, and it can double as a day bag when not in use for camera gear. I used it walking around Baltimore for a few days, and it was perfect for the trip. Rated 5 out of 5 by Anonymous from Beware it's a tight fit! 5 stars BUT, despite the great Domke quality and the great Domke Gripper strap, whoever claimed it would fit a DSLR and 2 lenses must have had a 3 martini lunch. The Panasonic G1 and two lenses are not happy inside and that is a VERY small Digital outfit. A leica and two small lenses would fit better. I'm exchanging it for the next size up. Rated 4 out of 5 by Glenn M. from Solid construction, trendy name. I use it to carry a camcorder, voice recorder and related accessories and cables. It's not the bag to store everything I have, but it is big enough to take everything I need for shooting basketball games and interviews. Not sure what a perfect bag would be, so I deducted a star because the canvas is a little heavy and the spring clip, though a Domke tradition, is a little annoying. Still, I wouldn't have any other. The Domke flip open top flap is the most convenient way to access gear. Some things that were not entirely clear to me from the description: -- There are two movable velcro partitions included with which you can configure three compartments. -- The optional, removable carry handle is just that, an optionally priced item (B&H # DOSHT). If you're spending this much on a bag, I think this handle is a useful and worthwhile accessory. -- The main flap has velcro attachment as well as the clip, so you don't have to close the clip all the time. The side flaps also have velcro. -- The open pocket on the back is very tight and can only hold something really slim. The front pocket under the main flap is fairly expandable for bulkier items. Rated 5 out of 5 by Anonymous from Snuggly Fits My 7D and Misc. Accessories The Domke F-8 is a pretty small bag. Though it was just big enough to fit my Canon 7D with 50mm 1.4 lens attached. Each side is padded, so I know that my camera is completely safe. Not to mention there is still adequate space in the (two) side and (one) front pocket, as well as a slim pocket attached to the top flap. This bag is well built and is perfect for when I'm simply out and about and don't need to carry a lot. Stores the hefty 7D body (no grip) with a short lens attached and miscellaneous accessories. I was wondering if the Sony Cyber Shot DSC-RX10 III will fit in this bag? Thank You! I tried the bag with a Leica Q and found it to be a tight fit. It fit, but just barely. I use it now for my GX1 M4/3 with a 14mm and 20mm. It works for that. The interior dimensions of the main compartment are 6.5 x 3.75 x 6.5 (16.51 x 9.53 x 16.51cm) (LxWxH). Your camera is 5.2 x 3.7 x 5.0 , so it should fit. Will this be able to fit a Fuji xt10 and kit lens 18-55mm? I have a Sony RX 10 IV, extra battery and charger, external flash and a couple filters. Will this fit into this bag? I have an Olympus OM-D EM1-II with a 75mm,a 12mm Pana 1.4, the tiny little flash that comes with EM1-II, charger and extra batt, two extra filters and a 14-42mm zoom, and they fit in the bag, keep in mind all these very fine components are tiny!, but so is the bag, very small and very convenient to carry my whole system. I'm sure the 42.5 f/1.2 without the 14-42 will fit. You NEED to have a short carrying strap, I made one. Domke makes one also. Will the back pocket fit an iPad Air? another question is about the size of the side pocket, on cm, please!and does it fit iPhone 5 and iPhone 6 s Plus - plugged/unplugged Apple's ear pods? The side pockets on the F-8 are 10cm across, 12cm height, 2cm opening. Will fit iPhone 5, but iPhone 6 sticks up about 2cm from pocket height, though with the flap down should keep it in place. Ear pods no problem. is this bag has the same hard bottom as in Domke F-5XB?I suppose there is integrated plate. Yes, there is a padded integrated bottom plate.